… and how everything has it’s verbose text (that I don’t understand, fwiw). Everything but “default”. The option to make CapsLock the Compose key is missing from the dialog box. It is in another dialog box. The “correct” behaviour (“it should be a ctrl key”) is also missing. Or is that what “default” means? I still don’t understand which idiot moved “ctrl” from its prominent and correct position next to the A to the dark corners of the keyboard it now lives in by default. It’s one of the most important keys on the keyboard and it was swapped with one of the most useless. Sjoerd: Actually, it’s the next option down in this one. But you are right, that makes 11. I wonder how that option interacts with this one? No, strike that, I don’t wonder. I don’t care at all. Not in the slightest. How many people actually change this behavior? I mean, how many people really want a key on their keyboard to do something other than what it’s labeled as? Even if you don’t like/don’t use the functionality, I can’t imagine having it do some other random function. That just makes it incredibly hard to use a different computer, or for someone else to use your computer. I say just throw away this entire options section. For any other key, I’d agree with you. (Although people who move between countries already have to put up with keyboard variations far worse than this.) But Caps Lock is an invention of sadists. Philip: There’s another section for ‘Ctrl key position’, which includes options for ‘Make CapsLock an additional Ctrl’ and ‘Swap Ctrl and CapsLock’. So I think that makes 13.
xkb has always struck me as a giant heap of insanity, regardless of desktop environment. Seems much clearer to me. Having a huge list of radio buttons doesn’t seem “GNOME” at any rate. Hmm… the <code> tags around that worked in the preview. Oh well. Ted: Many (though too few!) people touch type and don’t need the labeling. Much more valuable than print on a key (which fades after time anyway) is that the key does something meaningful. You don’t want a key you need continuously to be stuck in a place where you have to bend your little finger into a painful cramp to reach it. Conversely, you don’t want a key which is pointless and never used to sit somewhere where it can be easily hit by accident and cause mayhem. In the stone age, “ctrl” was next to “a” — in fact, last time I checked, Sun still sold “US UNIX” layout keyboards. Sadly, those are not much use on a laptop, so xmodmap is the only thing we can do. Smylers: I map Compose to the superfluous “ctrl” in the bottom right of the keyboard since that’s almost where you’d expect to find it on a real keyboard. The key labeled “ctrl” in its unnatural position at the bottom left gets mapped to alt, like the key with the silly flag next to it. The keys mislabeled “alt” next to the space bar are mapped to “meta” as they should be. I also swap “esc” and “~/`”. I’ve given up hope for a laptop with a Unix-friendly / programmer-friendly keyboard. Yeah, I have a remapable keyboard (Avant Stellar), so the key that would otherwise be CapsLock is the left Ctrl key. Personally I don’t understand why keyboard manufacturers still make keyboards with CapsLock on them. The Scroll Lock key is also totally useless in the modern era. Even if your computer is fifteen years old and slow for its age, there’s absolutely no way you could use Scroll Lock fast enough to allow you read all the text in a fast-scrolling terminal window. When keyboards first implemented the key, display hardware was physically incapable of scrolling more than four or five lines in the time it would take you to tap the key, but those days are gone, and good riddance. These days, by the time you double-tapped the key, several screenfulls would have scrolled by, and what good is that? Fortunately we now have scrollbars (or the screen command), so we don’t need to lock scrolling text. So I have absolutely NO idea why keyboard manufacturers still include it. Frankly, it should have been removed in 1995 when the OS/meta and app-window keys were added, if not sooner. As for Caps Lock, it never should have been on the keyboard in the first place. The caps lock is certainly useful if you happen to be a developer. GNOME has completely broken caps lock for me, in that it doesn’t allow me to mix uppercase characters and symbols. So, for example, a variable name in a script like INPUT_FILE is impossible to write using the caps lock. While people have a legitimate beef with the caps lock, it can be used appropriately and well, and GNOME has seriously broken its default behavior. (In fact, none of the listed options actually work as I want them to.) This is the sort of thing that would provoke even the most patient and die-hard all-caps hater to SHOUT. You may want to cc to the gnome bug I just opened. sorry for multiple posts, first post didn’t seem to work. 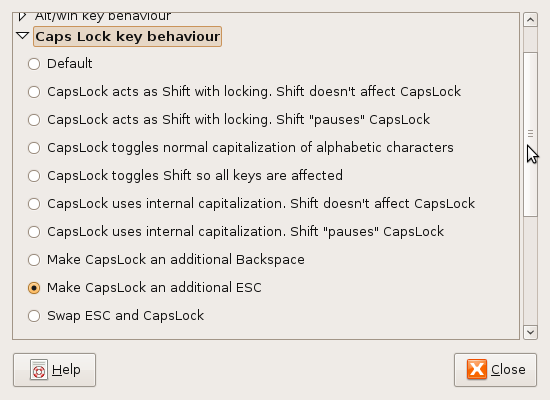 I do wish that “CapsLock acts as additional Ctrl” was in the CapsLock section as well as the Ctrl section. But at least it can be done, and it’s indeed one of the first things I do when setting up a new system. Honestly, CapsLock doing anything other than Ctrl behaviour is morally wrong.